Arrival of more interactive history e-books? I should preface this by saying that my experience with e-books is still very limited, but it does occur to me that we still haven't really taken advantage of available technology to provide a book reading experience any different than just viewing the same printed page through another medium ... and from what I glean from online reviews, even accomplishing that first generation paper-to-digital formatting is immensely problematic for many. In the Civil War publishing world, it appears that Savas Beatie will be among the first to dip their toes into this pool of unrealized digital potential. For their upcoming new edition of the Richard Sommers classic Richmond Redeemed, the publisher has teamed up with a content technology outfit called Olive Software to create an interactive e-book version. According to the Savas Beatie press release, using Olive Software's proprietary platform called SmartLayers the "digital edition offers scores of icons and links representing photos, further reading on related subjects, videos, and, most important of all, original author marginalia in the form of dozens of comments, assessments, and additional insights and information keyed to specific personalities, combat, tactics, and decision-making." With a reading public trained to expect sub-$10 e-books [though serious Civil War history books are frequently priced substantially higher], one wonders how quickly premium priced "enhanced" e-books will catch on, if at all. Another question mark would involve the willingness of today's non-fiction publishers to allocate the time and dollar resources necessary to do this right while at the same time fulfilling their other more traditional duties. Surely this type of thing will become commonplace at some point, the only uncertainty being when. 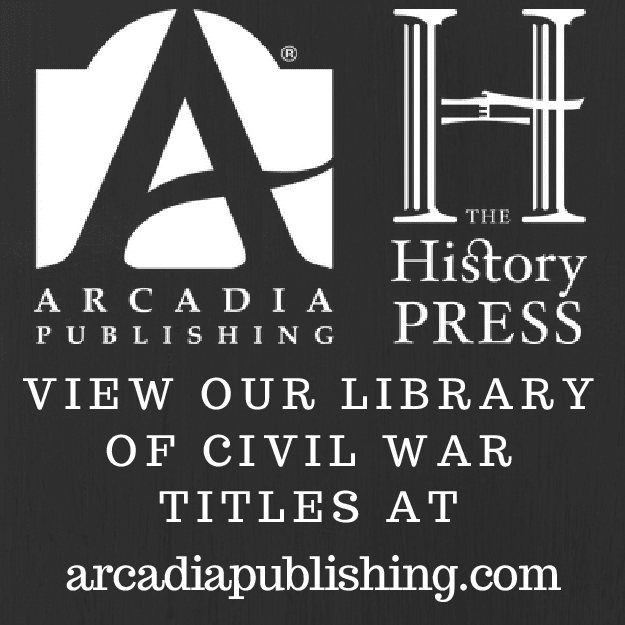 * The Battle of Pilot Knob: Thunder in Arcadia Valley by Bryce Suderow and Scott House. Decades ago, Bryce Suderow authored the first full length modern account of Pilot Knob. The new material in this revised 2nd edition, co-authored with Scott House, makes it twice the length of the original. * Soldiers in the Army of Freedom: The 1st Kansas Colored, the Civil War's First African American Combat Unit by Ian Spurgeon. "(T)he first black regiment raised in a northern state, and the first black unit to see combat during the Civil War," this book is the first 1st Kansas regimental history. * Work for Giants: The Campaign and Battle of Tupelo/Harrisburg, Mississippi, June-July 1864 by Thomas Parson. "Firsts" are becoming a common theme here. The Tupelo campaign and battle comprised a large part of Ed Bearss's Forrest at Brice's Crossroads and in North Mississippi in 1864, but no book has been devoted solely to the operation until now. For a detailed preview, see the author's feature article in the current issue of Blue and Gray Magazine. * The Early Morning of War: Bull Run, 1861 by Ed Longacre. Harry and legions of others have been waiting for an all encompassing FBR study of this type for a long time. Here's wishing our high hopes will not be dashed. * Shiloh: Conquer or Perish by Timothy Smith. Finally, a Shiloh history that doesn't hurry itself over the battle's 2nd day. We should also look forward to it as a career's worth of highly respected Shiloh expertise put to page. * To Retain Command of the Mississippi: The Civil War Naval Campaign for Memphis by Edward McCaul. Perhaps the most neglected of the major Mississippi naval confrontations, the gunboat battles for control of the Memphis stretch of river get a book of their own at last. 1. Kentucky Confederates: Secession, Civil War, and the Jackson Purchase by Berry Craig (UP of KY, 2014). With no previous book length studies of the Jackson Purchase in the Civil War, it's a bit unusual to have two released in the same year. Given the region's reputation as the South Carolina of Kentucky, it's no surprise that both Dan Lee's The Civil War in the Jackson Purchase, 1861-62 [my review] and Berry Craig's Kentucky Confederates focus on the Confederate perspective. Craig's study possesses the archival research its antecedent lacks and seems to take more of a political history approach to the topic than Lee's military-centered examination. So far, I like it. 2. Rebel Yell: The Violence, Passion, and Redemption of Stonewall Jackson by S.C. Gwynn (Scribner, 2014). I read somewhere between 1/3 and 1/2 of a pre-pub version of the book. Written in a popular style, the sections that I made it through didn't conjure up any surprises, but neither did they contain have anything particularly galling. Peter Cozzens's jacket blurb proclaims it to be the best Jackson biography he's ever read but I am skeptical of it supplanting Robertson's classic. Robertson's bio is well known for its admiring tone and we get some of that vibe here, too. Graham: "THE COAL RIVER VALLEY IN THE CIVIL WAR: West Virginia Mountains, 1861"
Michael Graham's The Coal River Valley in the Civil War details in full an almost forgotten chapter of the 1861 campaigns fought by Union and Confederate forces for control of Virginia's western counties. A large expanse of what is today southern West Virginia, the Coal River watershed basically consists of the Big and Little Coal Rivers, which combine for a short stretch as the Coal River before draining into the Kanawha River west of Charleston. Until now, no book has been devoted to the Civil War in this area. Like other parts of western Virginia, the Coal River Valley was divided politically, contributing many troops to both sides and making occupation an uneasy task. Cannel coal, an increasingly important resource for heating and lighting that was plentiful along the Coal and Big Coal, was another reason for fighting forces to pay attention to the area. Graham traces the region's economic development, demonstrating how the agricultural interests of the Little Coal clashed with the more industrial outlook of the Coal and Big Coal (including an extensive lock and dam system for transporting the coal to market) aggravating sectional tensions and dividing allegiances. For the Union army in 1861, the transportation network of the Coal River Valley also formed a potential dagger into the right flank and rear of General Jacob Cox's advance up the Kanawha River. Pro-Confederate forces gathering there could not be ignored. A series of small scale operations conducted during August-September 1861 are detailed in the book. Both sides used local militia in combination with regular forces, with Cox able to send expeditions of up to 1,000 men into action to be opposed by battalion-sized Confederates, the latter without the benefit of artillery. The first clash described by Graham is the September 1 Union victory against Virginia state forces at Boone Court House on the Little Coal River. Twelve days later, reinforced by better armed and trained Confederate cavalry, the southern forces surprised and defeated an encamped Union force of superior numbers along the Big Coal near Joe's Creek. They followed this victory up five days later by capturing a company of Union militia defending a fort at Pond Fork. Cox then put an end to this temporary enemy ascendancy in the region, sending military expeditions up both the Little and Big Coal, the former defeating the Confederates at Kanawha Gap and expelling them from the valley. For the rest of the war, Union forces would have only nominal control of Coal River Valley. With neither side able or willing to devote enough resources to its occupation, from 1862 onward the valley became essentially a no-man's-land subject to frequent outbursts of violence. The final chapter offers a comprehensive rundown of Union and Confederate raids and guerrilla actions into this contested ground, with Graham noting the close similarities in the civilian experience of wartime terror between Coal River Valley residents and the better documented home fronts of Border States Missouri and Kentucky. The author also points to events like the burning of Boone Court House and widespread destruction of private property during the summer 1861 operations as events comprising some of the war's earliest harbingers of the more generalized brand of "hard war" that was to come. Skillfully utilizing substantial numbers of primary and secondary source materials off all types, Graham's detailed accounts of the Coal River Valley fighting in 1861 are clearly written, well organized, and thoroughly documented. The author is also to be commended for commissioning a nice set of maps. The area map offers much needed geographical orientation and the battle maps comprise minutely detailed renderings of both terrain and company-scale tactical movements. Most Civil War local history casts readers adrift in this regard, not so Graham's exceptional study. A pair of appendices round out the volume, the first a series of capsule officer biographies and the second a set of Union and Confederate casualty tables. 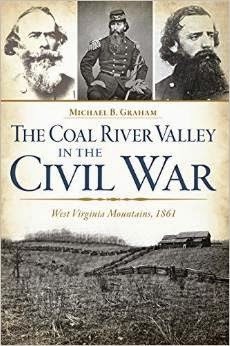 A comprehensive work of fine scholarship, Michael Graham's The Coal River Valley in the Civil War is the first full length history of military events that occurred in that developing region during the early months of the conflict. Its in-depth treatment of Union and Confederate operations conducted south of the Kanawha River during 1861 admirably brings to light a neglected corner of the sweeping campaign to secure Virginia's vulnerable and strategically important western flank. Graham's study is completely original and highly recommended! The best overall account of the sweeping Confederate recruiting drives conducted across Missouri during 1862 is contained in Michael Banasik's Embattled Arkansas. One of the better documented of these is Colonel Porter's series of operations in NE Missouri. Joseph Mudd's combined history and memoir With Porter in North Missouri is a classic account and a study of the Battle of Kirksville, a decisive defeat for Porter, was recently published. Now, Scott Sallee, the author of a Blue and Gray Magazine feature article on the same subject, has released a new book length treatment titled Joe Porter's War: Colonel Joseph C. Porter, C.S.A. and the Civil War in Northeast Missouri, 1862 - Including the Palmyra Massacre (Two Trails Publishing). I'm looking to obtain a copy soon and will report back on my findings. It's been oft said here that no good single volume history of the 1864 Price Raid exists. There is an unmentionable title from the 1990s, but Mark Lause's second-half effort The Collapse of Price's Raid: The Beginning of the End in Civil War Missouri (U. of Missouri Press, Nov '14) might have some promise after a mixed bag part one. The most anticipated study remains Citadel professor Kyle Sinisi's but at this rate it will be the Bicentennial before we see it. A new one I just found out about is Michael Forsyth's The Great Missouri Raid: Sterling Price and the Last Major Confederate Campaign in Northern Territory (McFarland, Spring 2015). My excitement level is tempered somewhat by my overall lack of great enthusiasm for his two previous Civil War titles, each covering the separate Arkansas and Louisiana wings of the Union army's 1864 Red River Campaign. I liked his Camden Expedition history better, primarily because it is the only book to cover the entire operation from beginning to end (if you'll recall, Bearss's classic skips the opening phases). That said, I'll undoubtedly get a copy and review it here. Ent: "THE PENNSYLVANIA RESERVES IN THE CIVIL WAR: A Comprehensive History"
With all its members hailing from the Keystone State, the Pennsylvania Reserves were an unusual Union army division. Formed in 1861 from the rush of men left over when the state vastly exceeded its federally mandated enlistment quota, the Reserves fought in all the major eastern theater battles with the Army of the Potomac before being mustered out in mid-1864. During this time, they forged an enviable combat reputation during the Seven Days, 2nd Bull Run, Antietam, Fredericksburg, Gettysburg, and Overland campaigns. 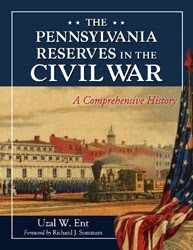 When it comes to the division’s organizational and battle history, the subtitle of Uzal Ent’s The Pennsylvania Reserves in the Civil War: A Comprehensive History is no immodest boast. The chapter describing the formation and training of the Pennsylvania Reserve Corps is relatively brief. It's in the campaign and battle history of the unit, which comprises the bulk of the work, where the level of detail is really unprecedented. Ent’s study is ostensibly division history, but his narrative also describes the action from the perspectives of the formation’s compositional regiments and batteries. The occasional side trips are equally compelling. In addition to penning a nice capsule history of the operations of the 1st Pennsylvania Reserve Cavalry Regiment between the summers of 1863 and 1864, the author also delves into operations outside those of the Army of the Potomac, specifically the roles of the 3rd and 4th Reserves in the 1864 West Virginia campaign. Of course, the creation of such a minutely detailed narrative requires a mountain of research and Ent’s bibliography offers the expected depth and range of source materials in the form of government documents, books, pamphlets, newspapers, and both published and unpublished diaries, letters, and memoirs. The endnotes are expansive, with source as well as explanatory notations. A range of supplemental features greatly enrich the text and increase its value as a research tool. In addition to photographs of many of the principal officers associated with the Reserves, a wealth of maps also grace the book’s pages. These are previously published drawings, rather than originals commissioned for this book, but most are quite good. Ent also provides order of battle and casualty tables for the featured campaigns and battles. Detailed biographical sketches of the colonels and generals that led the Reserves can be found in one appendix while another collects 1861 regimental organizational charts. The final appendix reproduces the texts of several public speeches made in the Reserves’ honor when the men returned home from the front in 1864. The author didn't include rosters or any systematic study of soldier demographics, but their absence is understandable given the consuming scale of such a task. Such things are difficult enough for a single regiment, let alone an entire division. Ent does however integrate into his narrative the experiences, told in their own words, of a host of Pennsylvania Reserves officers and enlisted men (over 150 by the author’s count). The study’s essence may be traditional top-down battle history, but the thoughts and views of men in the ranks are not neglected. While regimental and brigade histories of Civil War units are very common, division histories are exceedingly rare. Why this is so is open to debate, but Uzal Ent’s The Pennsylvania Reserves in the Civil War, for all the reasons outlined above, makes a powerful argument for their usefulness. 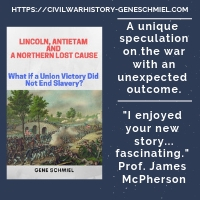 It is highly recommended reading for students of the Civil War’s eastern theater and those with a special interest in the contributions and sacrifices of Pennsylvania’s sons to the Union cause. 1. A Connecticut Yankee in Lincoln's Cabinet: Navy Secretary Gideon Welles Chronicles the Civil War edited by J. Ronald Spencer (Acorn Club - Wesleyan UP, 2014). This book consists of Spencer's selections of 250 diary excerpts from the war years, organized into ten chapters by theme. The editor contributes general and chapter introductions, footnotes, pieces of transitional narrative, and the afterword. Those wanting the full diary should grab a copy of the Gienapp edition . 2. A Gunner in Lee's Army: The Civil War Letters of Thomas Henry Carter edited by Graham T. Dozier (UNC Pr, 2014). Rising from battery to battalion commander, Carter was one of the stars of the ANV artillery service. 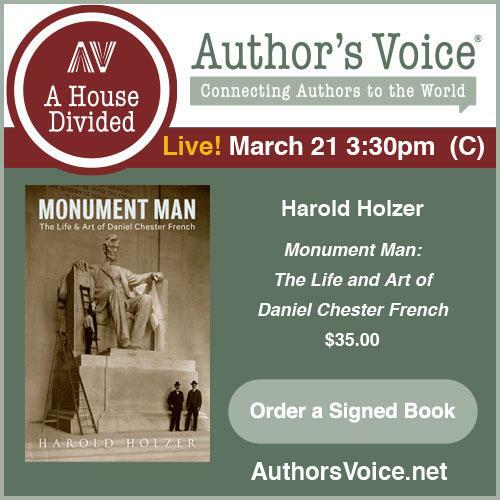 Drawn from his extensive military experiences, the writings collected in the book (in the form of 100 letters home to his wife) serve as important primary source material. Keen commentary on high ranking ANV officers, campaigns fought, and home front issues are cited as key strengths of the letters. 3. The Coal River Valley in the Civil War: West Virginia Mountains, 1861 by Michael B. Graham (The Hist Pr, 2014). Students of the 1861 campaigns in western Virginia should be excited about this promising looking study, which covers a number of obscure clashes (e.g. Boone Court House, Coal River, Pond Fork, and Kanawha Gap) fought along the economically important Coal River watershed. I was pleased to find that the author commissioned some really nice maps, as well. David Woodbury has conducted many interviews with prominent Civil War historians over the years. He's compiled 37 of these in a new Kindle e-book titled Talking about History: Historians Discuss the Civil War. David is providing it as a free download from now until Friday, just follow the link above. 1. Lincoln's Political Generals: The Battlefield Performance of Seven Controversial Appointees by Benton Rain Patterson (McFarland, 2014). A number of recent books and articles have attempted, with varying degrees of success, to revise the traditional view of the military ability of political generals (especially the Union ones) and the propriety of the appointment system that put these men in such high position. The introduction provides a pretty good rundown of the strengths and weaknesses of the system. Rather than offering his own ultimate judgement on the merits of each general, the author is more interested in presenting a balanced view of the military career of each and leaving it to the reader to decide. 2. The St. Albans Raid: Confederate Attack on Vermont by by Michelle Arnosky Sherburne (The Hist Pr, 2014). Arcadia Publishing, that widely distributed purveyor of local photographic histories, recently acquired The History Press and the merger's influence can already be seen in this study, with its thick, glossy paper stock and even higher than usual number of illustrations. The raid has been the subject of countless book chapters and articles but (IIRC) it's been a while since the last full length treatment. It's still on the other side of the horizon, but we do have a tentative release date for the third volume of Don Frazier's "quadrille" detailing Civil War military actions and campaigns in Texas and Louisiana. We've all seen promising series peter out and it's great that the momentum has been maintained with this one. The title, Blood on the Bayou: Vicksburg, Port Hudson, and the Trans-Mississippi (State House Press), clearly hints at what the content will be and is what we expected given what the author stated in past interviews. When I was writing my snapshot look at Stephen McGowen's excellent First Texas Cavalry history Horse Sweat and Powder Smoke last week I got to thinking about other Texas cavalry regimental histories. I'll begin by admitting that I've made no attempt to gather an exhaustive list, just a small number of titles that I've run into over the years. Most of these I haven't even seen in person. There are so many Terry's Texas Rangers (8th Texas Cavalry) books that I'm not going to list them here. 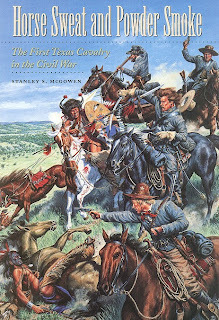 The three Texas cavalry regimentals that I've reviewed on the site are Thomas Reid's Spartan Band: Burnett's 13th Texas Cavalry in the Civil War and Stephen Kirk's more non-traditionally formatted Sul Ross' Sixth Texas Cavalry: Six Shooters & Bowie Knives and A Thousand Texans: Men of the 9th Texas Cavalry. The rest unfortunately remain unread by me. Douglas Hale's The Third Texas Cavalry in the Civil War is probably the best known of the bunch. More recent works are Martha Crabb's All Afire to Fight: The Untold Tale Of The Civil War's Ninth Texas Cavalry and Jane Johansson's Peculiar Honor: A History of the 28th Texas Cavalry 1862-1865 . The following are the most obscure, at least by my reckoning. From the previous decade are Chuck Carlock's History of the Tenth Texas Cavalry Dismounted Regiment, 1861-1865: "If We Ever Got Whipped, I Don't Recollect It" and Allen Hatley's Reluctant Rebels; the Eleventh Texas Cavalry Regiment . The rest go back further in time. Terrell's Texas Cavalry: Wild Horsemen of the Plains in the Civil War by John Spencer is from 1982 and three more examples -- Robert Weddle's Plow-horse Cavalry: The Caney Creek Boys of the Thirty-fourth Texas , Suffering To Silence: 29th Texas Cavalry, CSA, Regimental History by John Grady and Bradford Felmly, and Carl Duaine's Dead Men Wore Boots: 32nd Texas Volunteer Cavalry, CSA - 1862-1865 -- were published in the 60s and 70s. A few years ago, I was able to borrow copies of the Spencer and Weddle books but only had them enough time for a brief skim. As I recall, they both seemed worth a deeper look, though I haven't done so. Of the rest I know absolutely nothing. Pittman: "REBELS IN THE ROCKIES: Confederate Irregulars in the Western Territories"
Beyond its usefulness as a fine introduction to General Henry H. Sibley's 1861-62 Confederate campaign in New Mexico and Arizona, the most original feature of Walter Pittman's New Mexico and the Civil War (The History Press, 2011) was the emphasis placed on scout company operations. 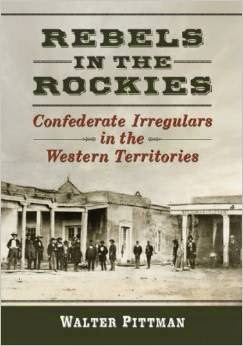 The author's new study Rebels in the Rockies: Confederate Irregulars in the Western Territories goes into far more depth on the subject, additionally extending its scope to Colorado and many other points west. Rebels in the Rockies begins with a detailed recounting of the formation of the four primary Confederate irregular companies that participated in the New Mexico invasion -- the San Elizario Spy Company, Arizona Guards, Arizona Rangers, and the "Brigands." The biographical treatments of the leaders of these mounted bands are quite good, as is Pittman's framing of the frontier milieu from which the men in the ranks, who tended to be older and wealthier than the typical Confederate soldiers, were drawn. Unfortunately, once the campaigning begins the source material associated with these units tends to dry up. According to Pittman, record keeping was almost non-existent and official documents were either lost or destroyed by war's end. Knowledge of their actions and movements during the New Mexico Campaign mostly comes from other Confederates and their Union opponents. This makes the campaign's rather lengthy narrative more detached and non-specific to the irregulars than one might have hoped, but apparently this could not be helped. Despite their unruly nature, the companies did have an excellent battlefield reputation and were among the most reliable units in Sibley's expedition. The other major theater of events examined in the book is Colorado Territory. Scholarship in the arena of pro-Confederate activities in Colorado remains fairly sparse, with Daniel Ellis Conner's A Confederate in the Colorado Gold Fields [an edited version of which was published decades ago by University of Oklahoma Press] being perhaps the best known primary source. Pittman cites a figure of 30-40% of the population originating from southern and border states, and he provides a fairly hefty amount of background information related to Colorado's most prominent citizens of pro-southern sympathies, including the individual reputed to be the richest man in the territory. No solid evidence of insurgent activities or organized Confederate plots in Colorado exists, but many of these leading figures, who either left the territory on their own volition or were expelled by suspicious and increasingly repressive Union authorities, later returned as irregular fighters. The two missions with the highest profile, those of George Madison (1862) and the Reynolds Gang (1864), are well documented by Pittman in two lengthy chapters. With Union authorities possessing vastly superior intelligence and communications networks, both enterprises ended badly. Captain Madison, tasked in 1862 with Confederate recruitment and disruption of enemy communications in Colorado, had some early success but his base at Mace's Hole was discovered and soundly broken up by Union forces. The Reynolds Gang, subject to an intense and effective manhunt after a stagecoach robbery, was entirely dispersed or captured. In a notorious incident, five of the prisoners were murdered by their Union captors. While the book's primary focus is on New Mexico-Arizona and Colorado, pro-Confederate activities in other western states and territories are summarized in brief. Pittman also follows at some length the continuing service of Brigands veterans attached to Texas cavalry units through the 1863-64 campaigns in Louisiana. In the end, the author arrives at the inevitable conclusion that pro-Confederate efforts in the Far West were a failure. With the disastrous conclusion of the New Mexico Campaign, they were never again able to seriously threaten federal control of the western territories. At best, Confederate irregulars were able to periodically distract local federal forces. An important related point raised by Pittman is just how effective Union authorities were in policing the vast open West. With limited resources, they squashed all threats and kept sizable civilian populations of uncertain loyalties well under control during the entire war. This effort is worth a book length study of its own. For all the above reasons, Rebels in the Rockies is recommended reading for those seeking a more detailed treatment of Confederate aspirations in the Far West. My feeling that 2014 has been a below average one in terms of new book arrivals at CWBA home base appears to have some substance. I don't record total number of books received each year but a quick Booknotes hand count for identical periods (JAN - AUG) for 2013 and 2014 reveals a 33% decrease. A big drop for sure but what it really means I have no idea. The 2014 drought periods have been longer and more numerous than years past, but since I am only counting books that arrive in my own mailbox it would be wrong to use this isolated example to draw any conclusions about Civil War publishing in general. I do have a fairly large wishlist of fall titles so things may be looking up. Of course, those authors and publishers who do continue to regularly send new releases my way are much appreciated. One of the more gratifying aspects of Sesquicentennial publishing has been the sudden appearance of titles dealing with the conflict years in the Far West. I remarked earlier about Civil War Wests: Testing the Limits of the United States (Feb '15), but the same publisher (University of California Press) will be releasing yet another subject-related essay collection the following month Empire and Liberty: The Civil War and the West edited by Virginia Scharff (March '15). Something Civil War-y got into UC Press's cheerios. "Horse Sweat and Powder Smoke: The First Texas Cavalry in the Civil War"
Being busy in school at the time, Stanley McGowen's Horse Sweat and Powder Smoke: The First Texas Cavalry in the Civil War (TAMU, 1999) slipped by me when it first appeared. 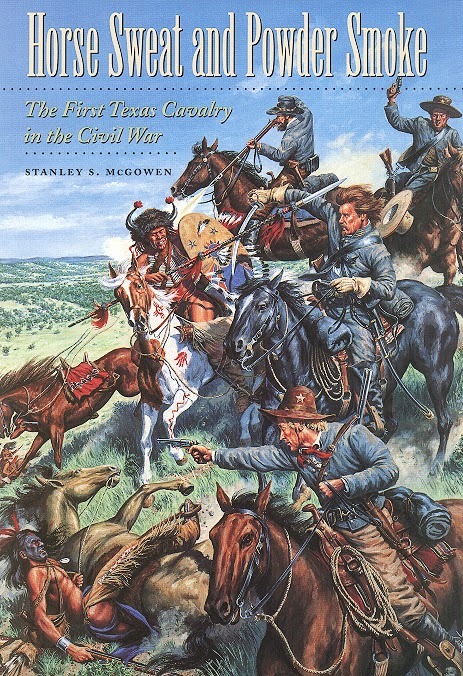 A decent number of modern Texas cavalry unit studies have been published before and since [many of the earlier ones quite pricey], but this one is my favorite to date. Even 15 years later, it's not too late to get a brand new, shrinkwrapped copy, either, as the book remains in print and widely available. Modern regimental studies of units raised in the Trans-Mississippi and remaining there during their entire service are rare and the First, in its several forms, has the added bonus of having a fascinatingly disparate range of duties. From February 1861, the job of the First Texas Mounted Rifles (a 12-month regiment) was primarily to patrol the Texas frontier and protect settlers from frequent Comanche and Kiowa attacks. When this initial enlistment period expired in spring 1862, four companies formed the nucleus of a cavalry battalion that guarded the coast but also dealt with internal troubles stirred up by pro-Union German immigrants. Officers and men from the old First fought in the Neuces battle but apparently did not directly participate in the prisoner murders that tainted the aftermath. In May 1863, the regiment was reconstituted as the First Texas Cavalry. The Texans spent much of the remaining period of the war on the move safeguarding the essential cross border cotton trade, defending the state from a number of Union amphibious operations (their duty stations ranging up and down the entire coastline between Fort Brown and the Texas-Louisiana border), and campaigning in Louisiana with Confederate forces opposing the Union army's 1863 Texas Overland Expedition and 1864 Red River Campaign. McGowen does devote a great deal of space in the book to the difficulties of frontier military service in the Confederacy, including how the Texans dealt with scarcities in food, supplies, weapons, horses, equipment, and medical services in camp and on campaign. Horse Sweat and Powder Smoke really is a noteworthy original when it comes to Trans-Mississippi regimental histories. From Indian fighting to border security to suppressing armed internal dissent to defending coastal and overland routes from Union invasion, the variety of roles performed by the men of the First Texas Cavalry almost perfectly encapsulates the entire range of Civil War Texas military experiences.